This article was first published in Solar Today in the Nov/Dec 2011 issue. For most people, “solar energy” invokes the technologies of photovoltaics (PV) and, more generally, active solar systems that use electrical or mechanical systems, like most solar water-heating systems. 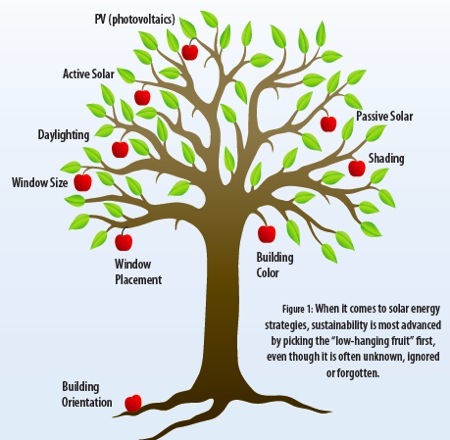 Unfortunately, these strategies are “high-hanging fruit” in that they are expensive ways to enjoy the on-site, pollution-free benefits of solar energy. Should we not first pick the low-hanging fruit, such as passive solar techniques? Although not always recognized as such, the following strategies are all directly solar: the form and orientation of a building; the size, number and location of windows; the solar heat gain coefficient of the glazing; daylighting; shading; the landscaping around a building; green roofs and walls; and the color of the roof and walls. All of these strategies utilize solar-responsive design to reduce the energy consumption of buildings. These are the low-hanging fruit (figure 1). Although some of these strategies do not collect solar energy, they save energy by designing with the sun in mind. Just as a dollar saved is a dollar earned, energy saved is equivalent to energy produced. not only is it cheaper to save energy, it is also much more sustainable. Some of these low-hanging-fruit strategies are a “free lunch,” in that they cost nothing and yet save much energy. Some are even what Amory Lovins has called, “better than a free lunch, it’s a lunch you get paid to eat,” in that they save energy while reducing the initial cost of the building. For example, rotating a certain building 90 degrees during the design stage can not only save up to 50 percent of the energy needed for heating, cooling and lighting, but it can also lower the initial cost because the size of the cooling system can be reduced (figure 2). Figure 2: Some low-hanging-fruit strategies are free or can even save money by reducing the initial cost of a building. For instance, in certain cases, rotating a building 90 degrees can reduce the energy required for heating, cooling and lighting by up to 50 percent. Though not usually free, a strategy that is usually cost-effective is shading. It may well be the solar strategy with the most benefit now and in the near future because shading can greatly reduce the energy consumed by air-conditioning systems. mechanical cooling is no longer limited to developed countries — it is widely used in China, Southeast Asia and increasingly in India. In hot and humid climates, where most of the world’s people live, shading can reduce both the need for cooling equipment and the energy needed to run the equipment. even places fairly far north get hot. In cloudy London, at 51 degrees north latitude, shading devices are used to minimize the use of air-conditioning systems (see photos above). Germany, at 51 degrees north latitude, may be the developed country with the most use of shading devices, a strategy Germans use to avoid the environmental consequences of air conditioning. Shading may be the solar strategy with the most immediate benefit because it can greatly reduce air-conditioning needs — an issue even in far-north climates. 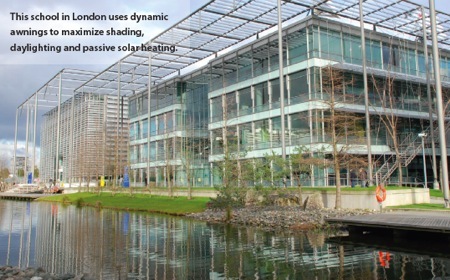 The Chiswick Park office complex in London makes extensive use of shading systems. Not only would shading benefit most people in the world, but it also provides benefits when solar radiation is most plentiful. Passive solar, on the other hand, is needed by fewer people on earth and is collected when solar radiation is at its minimum. This point is not an argument against passive solar but in favor of using all solar strategies, and especially shading. Who promotes the low-hanging solar strategies? because orientation, color of roof and walls, some shading strategies and so on are ideas that cannot be sold for money, they tend not to be promoted by the market. Instead, they must be promoted by nonprofit organizations such as the American Solar Energy Society (ASES). New and “cool” ideas are usually more popular than tried-and-true ones. but new ideas typically can’t beat the time-tested ones, and more often they complement rather than replace existing ideas. For example, PV should be seen as a complementary solar strategy rather one that displaces the existing solar strategies. 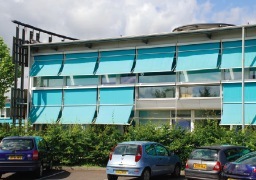 This school in London uses dynamic awnings to maximize shading, daylighting and passive solar heating. For example, fixed-south-facing overhangs are widely promoted in the architectural literature even though they perform poorly in climates that require summer shade and winter sun. Skylights are also widely promoted even though they collect the most sun in the summer and least sun in the winter, which is the exact opposite of what is required. And the literature promotes vertical fins on the east and west, even though they don’t work well and are terrible for daylighting. I recommend that ASES strongly promote solar-responsive design that includes all of the solar strategies and especially the low-hanging ones. I further recommend that the 2012 ASES National Solar Conference, World Renewable Energy Forum 2012, place a priority on selecting papers and keynote speakers on the subject and holding workshops on solar-responsive design. Another way to exchange the latest practices and research is through these pages. In upcoming issues of SOLAR TODAY, look for my articles on passive solar, shading and daylighting techniques. After all, this low-hanging fruit is our best strategy for improving health and productivity and reducing energy usage, associated carbon emissions and even building costs. Norbert M. Lechner (lechnnm@auburn.edu) is an architect, professor emeritus in the College of Architecture, Design, and Construction at Auburn University, LEED-accredited professional and ASES Fellow. He is an expert in energy-responsive architectural design with an emphasis on solar-responsive design. Lechner’s book, Heating, Cooling, Lighting: Design Methods for Architects, (4th edition available soon) is used by more than a third of all architecture schools in the United States and in architecture schools worldwide. He is also a sought-after speaker, giving keynote lectures and workshops at universities and conferences around the world.